One of the most popular promotional items for business gifts are personalised pens. They are amongst the most widely distributed products in events, trade fairs and other corporate meetings. Their size and practicality makes them ideal, and people use them every day. If you are thinking about creating personalised pens, we recommend that you first choose where and how to distribute them. In fact, the best pen to choose will depend on the type of event. In Camaloon we have a range of different types of pen to choose from. You can preview the final result by simply uploading your logo before continuing the design process. From the unmissable “Pixel Matt” pen to the “Pure” design, you'll find various models to meet different needs. Once you have selected the type of pen you’d like to personalise, you can choose the colour that best suits your logo. You can use simple colours if you prefer a more classic design (such as black, white or blue), or choose bolder, brighter colours for a more creative look. These personalised pens are available online, with a minimum order of 50 units for each type and design of pen. If you’ve decided where and how to use your personalised pens and the number of people you’d like to reach, remember that the best price per unit depends on how many printed pens you order. 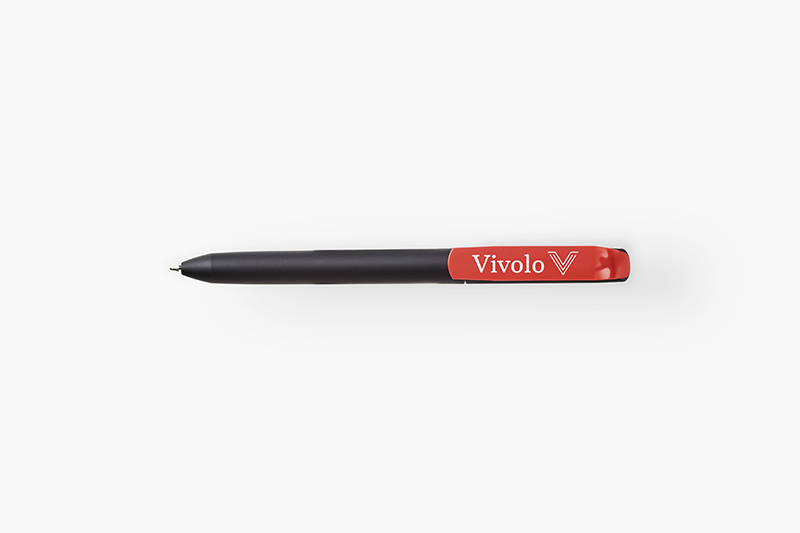 You can begin by uploading your logo onto a 2D image of the type of pen you have chosen. With our online tool, you simply have to upload a high-resolution file to ensure the highest quality results in printing. If there is any detail which doesn't look quite right when you upload your image, we recommend altering your logo to obtain the best image for your pens. First remove any superfluous details, because those little details will not be visible and cannot be reproduced on such a small printing area. More than 90% of people write with their right hand, so bear this in mind when deciding which side your logo is printed on. It’s important that the logo is always facing the person who is writing. In fact, a common error is placing the logo on the wrong side, facing away from the writer. Carefully check the position of your corporate design on the pen before continuing the design process. After uploading your logo onto the pens and checking that everything is correct, you are ready to complete your order. Fill in your details and choose a delivery option to finish. Our team of graphic designers will review your logo and check through the image carefully before production begins. Simply wait for your personalised pens to arrive, then your promotional marketing campaign will be ready to go!